The simplest of the recipes are the most rewarding and while I might not be the first person to say it but I strongly agree with it. And while we continue to long for rains in Delhi, all we have is humidity and baking is the best remedy this season. I mean ofcourse one doesn’t have to stand facing the stove, sweating and cooking in this humid weather and still have some warm delicious goodness ready to be devoured. So bless the person who first invented baking. Well ofcourse I am not here to tute on baking but just share yet another deliciously, mouth-watering recipe that my oven delivered this evening. 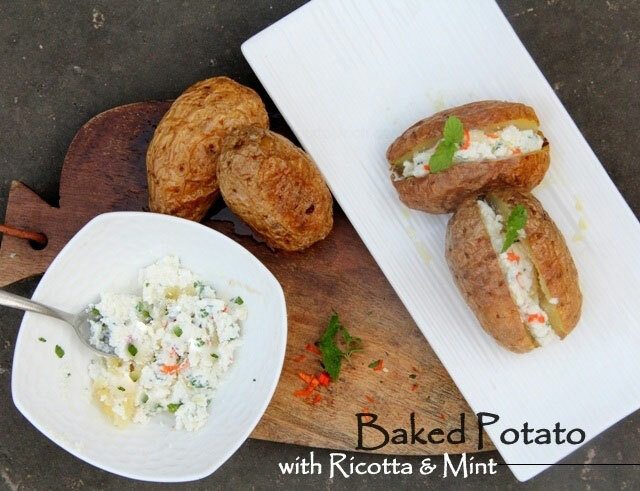 The potatoes available during this season are great for baking with skin, one for their size and two for the clean creamish skin and also because these are the faster cooking variety. And believe me if you’ve perfectly baked potatoes once you are going to be captive for a lifetime. What is also great is that one has an unlimited option of fillings to play with since potatoes pair well with almost everything, starting from meat to seafood to plain simple cheese or even a fresh simple salad. 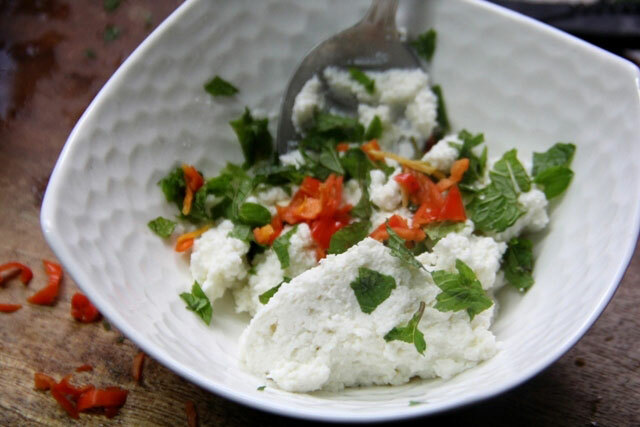 Everything goes well with potatoes, well almost everything I mean and today I just mixed some gorgeous Ricotta with mint and red Chinese chillies, dressed it up with a little salt and a generous drizzle of good extra virgin olive oil and we were good to go. 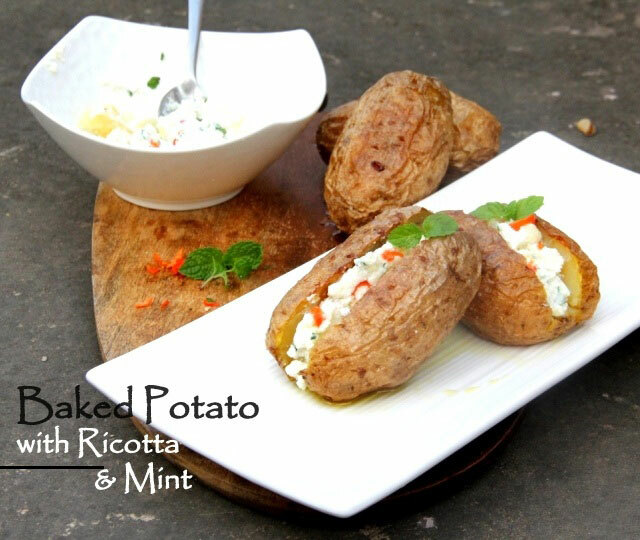 The perfectly baked potatoes, delicious mint and feta filling topped with the good extra virgin olive oil, simply amazing. 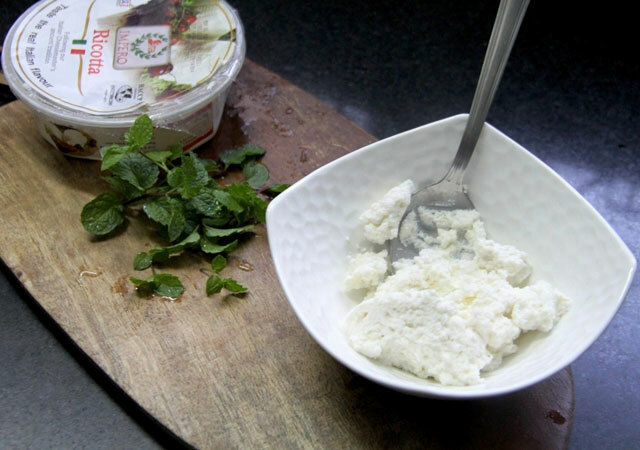 Do not wait just try this one and you’d be surprised how easy a delicious recipe as this one can be. 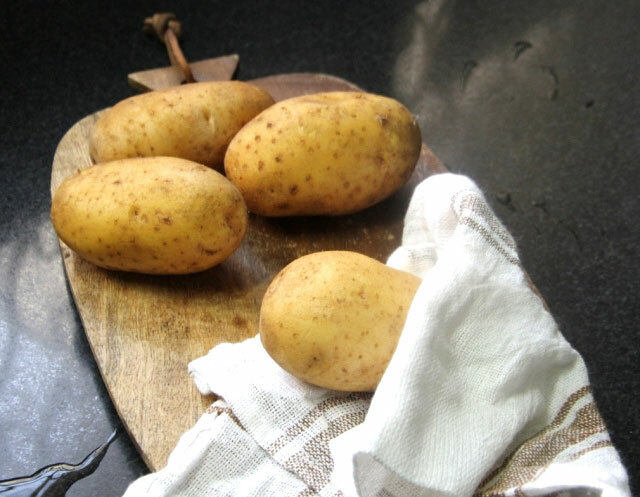 Wash the potatoes well, wipe with a cotton kitchen towel. 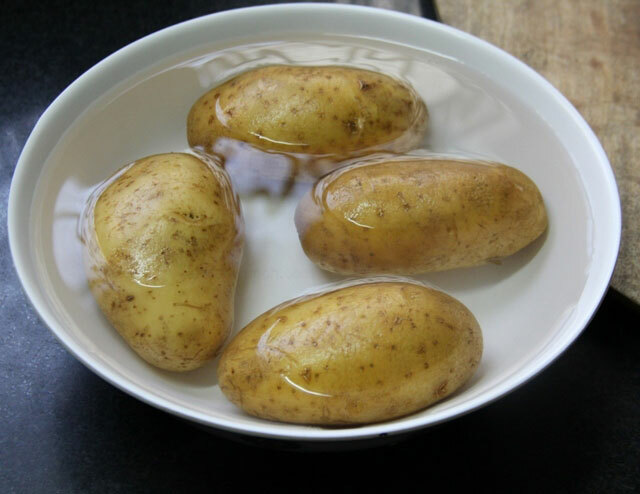 Then prick the potatoes generously with a skewer all around, make holes about every 1 inch apart. 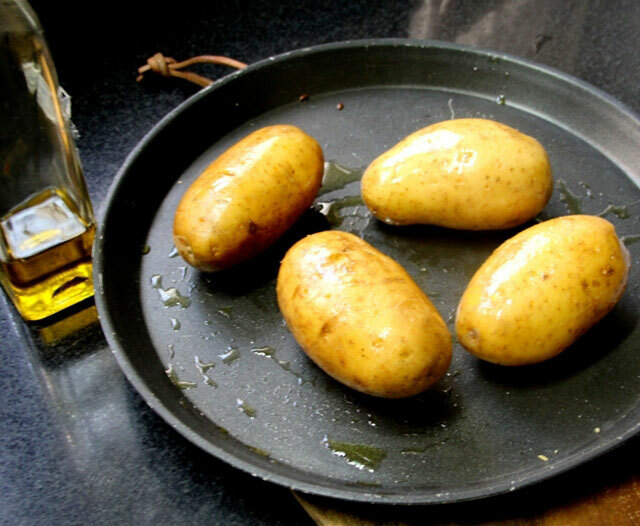 Smear the potatoes generously with good extra virgin olive oil and sprinkle coarse baking salt all around the potatoes. Bake on the middle shelf for 1hr 15 min to 1hr 30 min depending on the size of potatoes. 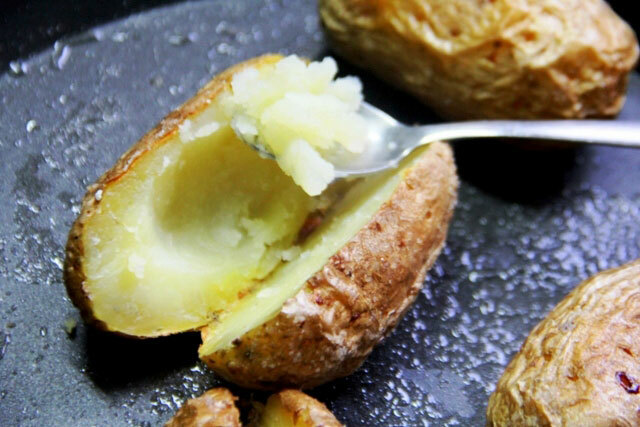 Do a quick check with one potato, press it from both the tail ends and it should crack open if its done. Cut each potato into half, do not touch with bare hands but use a tong, scoop out some potato using a spoon from the centre of each part. To make the filling, mix all the ingredients and the scooped out potatoes together and fill into the pockets and slightly press the two slices back together. Drizzle some more extra virgin olive oil, garnish with a sprig of mint and serve hot. 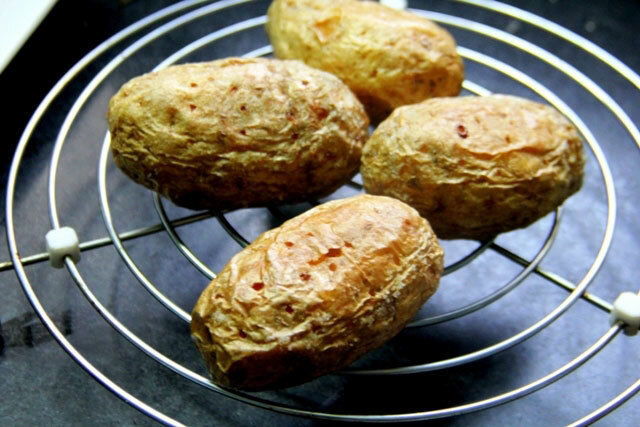 Be careful not to touch the hot potatoes while slicing it. Use a filling of your choice, ranging from meat to a salsa. 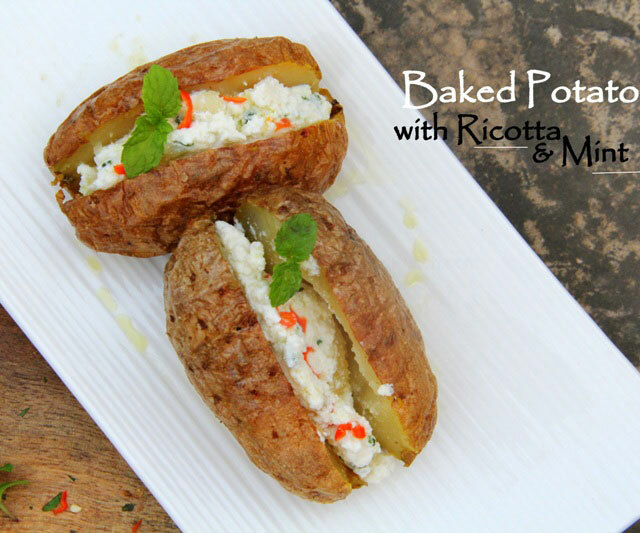 Or even add just some mozzarella on the top and grill for another min or two and enjoy some cheesy potatoes.